Hamilton, ON's annual Supercrawl extended its lineup earlier this week to include hometown heroes Arkells, and now it has announced a surprise show from the band taking place later tonight (July 11). The secret pop-up show will be taking place this evening at an undisclosed venue. The special performance has the rock act teaming up with Boris Brott & the National Academy Orchestra to play tracks off the Arkells' upcoming High Noon LP. The collaboration was produced alongside Igor Saika-Voivod, who also delivered orchestral arrangements on High Noon. Four pieces from the album will be performed four times throughout the course of the night. Space is limited, with roughly 70 people being let in per performance, with a cash donation be asked for at the door. Proceeds will be given to the SpecKids charity. You can grab tickets and get the venue specifics in person at Dr. Disc (20 Wilson St.) and Cheapies (67 KIng St. E). 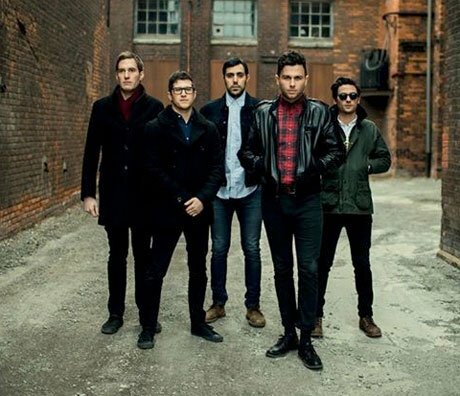 Beyond these performances, Arkells will appear at Supercrawl on September 12, while their album hits stores August 5. You'll find the lyric video for the band's "Come to Light" down below. Supercrawl, meanwhile, hits James Street North from September 12 to 14 and will feature Spoon, Four Tet, How to Dress Well, Kevin Drew and more.